Several bright pink azalea shrubs are in full bloom. The flowers and green leaves are slightly wet, indicating that a rain just watered the blossoms. Commonly seen in both the spring and summertime, pink azaleas are a welcome addition to any garden because of their beautiful hue. Azaleas are flowering plants that can be classified as evergreen or deciduous. Evergreen azaleas hail from China, Korea, Taiwan, and Japan, and come in colors such as pink, red, orange red, lavender, purple, and white. They are mostly found in flower shops, though some species can serve as ground material. Deciduous species come from southern Europe, Japan, the west coast of North America, and the eastern United States, and Canada in colors including yellow, orange, red, pink, white, and lavender. These are more natural and can be used in borders, hedges, barriers, and in backdrops. While there are many different types of azaleas, they respond to the same type of horticulture, more or less. Azaleas thrive in light, but they prefer to stay out of direct, hot sun or heavy winds. However, they can thrive in hot, humid conditions. They prefer acidic, moist, and well-drained soil. Many gardeners appreciate azaleas because they are easy to transport due to their shallow root system. When it comes to pruning, evergreen azaleas require very little. Simply remove any dead or week wood, and trim the plants so that they are attractive and remain within bounds. To prune deciduous azaleas, just remove weak or dead wood. 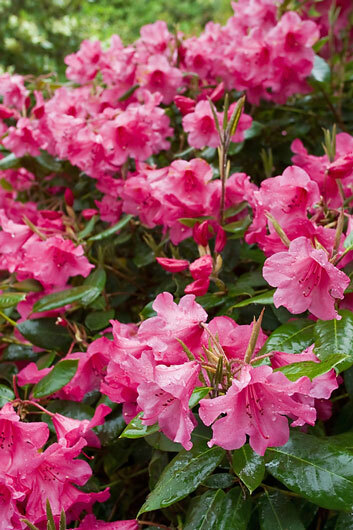 The best time to prune azaleas is right after they have flowered.